(Nanowerk News) Not present when the reaction starts or ends, the driving force behind turning poisonous carbon monoxide into a benign form is a single atom that appears in the heat of action, according to scientists at Pacific Northwest National Laboratory (Nature Communications, "Dynamic formation of single-atom catalytic active sites on ceria-supported gold nanoparticles"). In the simulations, carbon monoxide binds with a gold nanoparticle on top of a cerium dioxide support. 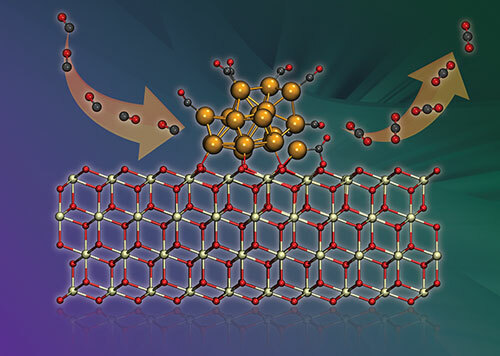 The carbon monoxide changes the surface; it spurs a single gold ion to leave the nanoparticle. The ion delivers an electron and returns to the particle. "This is single-atom catalysis," said Dr. Roger Rousseau, a computational chemist at PNNL who co-led the study. "With a new twist -- the catalyst is dynamically formed under operating conditions." "Unless you know what is happening, and when, and where, you really can't tune the properties of the catalysts to get what we need," said Dr. Vanda Glezakou, a computational chemist at PNNL who co-led the study. For about two years, Rousseau, Glezakou, and their colleagues delved into understanding the mechanics of a metal catalyst and supporting material used to drive the oxidation of carbon monoxide. The reaction is completely tractable using computational simulations. Understanding the oxidation reaction will provide insights into fuel cells and air cleaning systems, as well as more complicated ketone and aldol reactions. In the first year, the team built the protocol to model the cerium dioxide support, which performs electron transfer or reduction-oxidation reactions, along with a gold nanoparticle catalyst. "The protocol and the values we needed didn't exist in the literature," said Rousseau. "So, we had to start from scratch. These types of studies take more time and resources than typical calculation of energies." With the energies and other parameters determined and the computational model built, the team ran numerous simulations. They used computers at EMSL, a U.S. Department of Energy scientific user facility. The simulation ran ab initio molecular dynamics and static density functional theory calculations to investigate the reaction mechanism. What they found was quite unexpected -- a single-molecule dynamic catalyst. The single gold cation, which only exists during the reaction, breaks off from the gold. It catalyzes the reaction and then returns to the gold. This unexpected phenomenon results from the single-atom site's ability to work with the redox properties of the support. The team is continuing to delve into the mechanism by which the metal particle and its support work. "What we are learning is that the supports work as hard as the catalyst," said Glezakou. They are now working on catalysts and supports for adding hydrogen and removing oxygen to transform plant materials and other biomass into fuels.